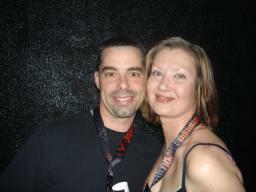 Fritz and Rick attend Jagermeister Music Tour in Niagara Falls, NY on March 31, 2007!!! Fritz's Polka Band is truly proud to be a member of the Jagermeister Family. Just one of the many perks that Jager provides bands is the opportunity to check out the Jagermeister Music Tour (in a VIP way!) when it's in-action. 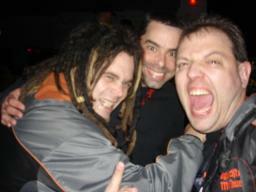 On Saturday, March 31, 2007, Fritz and Rick made the trip to Niagara Falls, NY to check out the Jager Spring Music Tour, at the Dome Theatre, featuring Stone Sour as the headliner. Fritz and Rick had a blast meeting old friends from the "Jager Family" that evening, as well as making new friends. Below are 17 pictures taken that festive night. 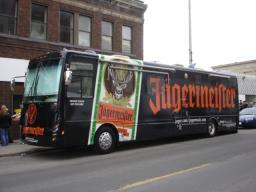 The Jager bus, as pictured here in front of the Dome Theatre in Niagara Falls, NY on March 31st. 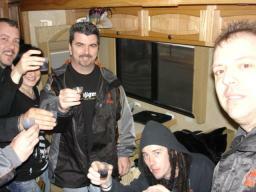 Fritz toasts some Jager with members of the Jager Family, including Dan (w/ hood), from the band, Stemm, on March 31st. 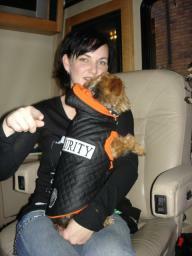 Tracy (one of the Jager busdrivers), is pictured here with the official Jagermeister dog, Gigi in Niagara Falls, NY. 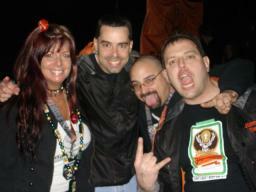 Rick and Fritz pose with some new friends from Pennsylvania, during the Jager VIP Party on March 31st. 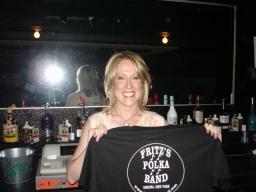 Yep....even the bartender at the Dome Theatre loves Fritz's Polka Band! 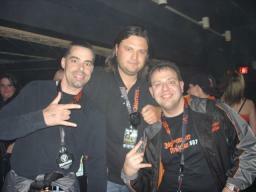 Rick and Fritz party it up with Nic, from the Jager band, Waiting 4 Never, on March 31st. 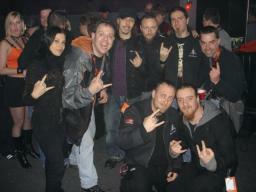 Fritz and Rick pose with the band, Lacuna Coil, during the Jager VIP Party at the Dome Theatre. 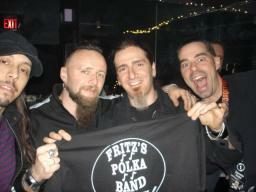 Rick presents members of the band, Lacuna Coil, with an FPB/Jagermeister t-shirt on March 31st. 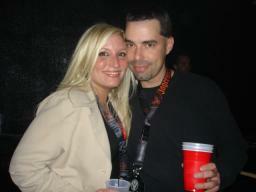 Rick poses with his new Jager friend, Sonia, at the Dome Theatre in Niagara Falls, NY. Rick poses here with the Jagerettes, Jenn and Laura, in Niagara Falls, NY. The Jagerettes pose with Stone Sour, during a Jager VIP Party meet and greet on March 31st. Rick and Fritz are shown here on March 31st with the Jagermeister Tour Manager, Jack Carson, who throws one helluva party! 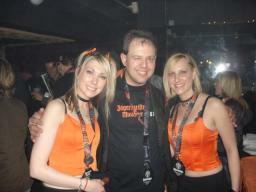 With a wink in his eye, Fritz happily poses with Laura and Jenn, the Jagerettes who added to the festivities (in a nice way) at the Jagermeister Show on March 31, 2007. 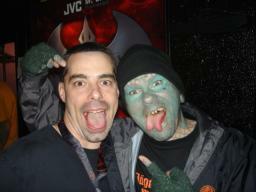 Fritz and his Jager pal, Lizardman, are shown here during the Jager VIP Party on March 31st. At the Dome Theatre, Rick hollers "stand up and shout" as he poses with a couple of gals from Toronto that know each other quite well. Rick poses with his new friend, Fran, on March 31st at the Dome Theatre. 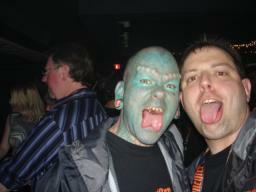 Rick meets up with his Jager pal, Lizardman, as he departs the Dome Theatre in Niagara Falls, NY on March 31, 2007.